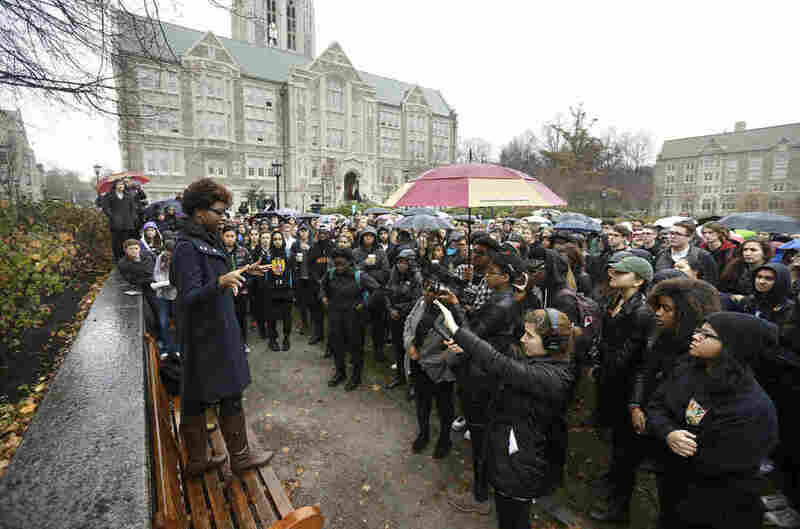 College Campus Protesters Across The Country Swap Ideas, Information As college students around the U.S. protest institutional racism, the movement is growing more coordinated. Activists are inspiring each other on social media and sharing strategies and tips online. Students at Boston College listen to a speaker as they gather during a solidarity demonstration on the school's campus, Thursday, Nov. 12, 2015, in Newton, Mass. Student organizers from the college released a toolkit for protesters at other campuses — part of a growing trend towards nationwide coordination of protests. Earlier this month, fifty students at Boston College gathered to sing Christmas carols — with a twist. "You tell us to trust, but we know we must, keep walking through a white man's wonderland." The students sang that parody outside of their school's biannual Board of Trustees luncheon, to highlight the lack of diversity among faculty, the administration and the Boston College Board itself. They wanted to reach a group of people with a lot of power over decisions, student organizer Sriya Bhattacharyya says. It's a goal shared by student organizers on other campuses. And as protests against institutional racism gain momentum across the country, they're becoming more coordinated. While student movements differ from school to school, organizers are sharing their tactics across the country. "Some people have reached out to us asking us like, 'Do you have like a resource packet? How did you create this movement? Can you help us? We want to be as organized as you guys are,' " Bhattacharyya says. So the Boston College group created a toolkit, a six-step guide to campus activism that they blasted out on a few group email lists. Della Mosley is a doctoral candidate at the University of Kentucky, where last week 40 students held a die-in outside of faculty offices. She says that BC toolkit helped activists there use social media more effectively. "We have a Twitter and we have a Facebook, but we're not using it to the same degree," Mosley says. "And so they had some kind of concrete tips in there on how often to post, like what times of day to post, things like that." The Boston College activism toolkit isn't the only one out there. There's an extensive guide created by The Black Liberation Collective, a network of black students with an online presence galvanizing student organizers to hold "student blackout" protests, die-ins, sit-ins and walk-outs. "A lot of people aren't very aware of how to do certain actions, so we want to prepare them and direct them to the correct resources," says Zellie Imani, a founding member of the group. School administrators are grappling with how to react to the movement. Last year NASPA, a professional organization of higher education administrators, released an 18-page brief entitled, "Responding to Campus Protests, A Practitioner Resource." Kevin Kruger, the president of NASPA, advises school administrators not to be afraid of student activism. "There is clearly a balance between giving students the space to exercise their first amendment rights and to engage in that dialogue, but we also need to ensure that the academic mission of the institution goes forward," he says. According to The Black Liberation Collective website, this fall student activists from at least 73 schools have issued demands to their school administrators. Most called for a more diverse faculty, diversity training and increased funding of cultural centers. Boston College organizer Sriya Bhattacharyya says that at the core of all these movements is the unifying belief that black lives matter. "If we don't take the responsibility to do something with the relative power that we have in the context that we're in, what are we going to say about ourselves as living in this era?" she says. With winter break around the corner, both students and administrators will have some time to reflect on this fall's activism, and how it's become a more unified front.